Freestanding Church of Ireland church, built 1830, comprising four-bay nave with thirteenth century three-stage crennellated tower to west and later nineteenth century chancel to east. Pitched slate roof. Roughcast rendered walls. Pointed arch, round-arched and squared headed openings with limestone dressings. Double-leaf timber matchboard doors with strap hinges. Retaining medieval inscribed slabs and eighteenth and nineteenth monuments. Tenison family mausoleum to site. Pair of ashlar limestone gate piers with wrought-iron gates to west. Lannléire is the ancient name of Dunleer. The monastery of Lannléire was founded by the brothers, Furudran and Baothan, in the sixth century, and so, under both names, Lannléire and Dunleer, the district has a recorded history of 1,400 years. Furudran and Baothan succeeded one another as abbots of the monastery of Lannléire. Their feast day falls on 18th June. 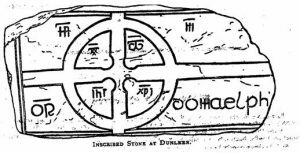 Dunlere, Dunler, (Dunleer): The name Dunler appears as early as 1212 in Pontificia Hibernica. It was then in the possession of the Knights Hospitallers of Jerusalem. Walter Haddesore vicar of Dunler and dean of Drogheda. He summoned the clergy of his deanery for 21st June 1367 and laity of every parish for 22nd June 1367 at St Peter’s, Drogheda. Richard (Henry) Hyng was appointed to the perpetual vicarage of the Holy Confessors, Fretanus and Brethanus of Dunleer. He was inducted 11th September 1544. It is probable that Richard Hyng (Henry) was the last vicar of Dunleer to conduct religious services at Dunler in accordance with the Catholic rite. 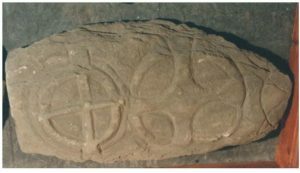 In the cross-head, the stone bears the Alpha and Omega, as well as the letters IHC XPC, found on a few of these slabs, such as those at Glendalough and Tullylease. In the other cantons are groups of three strokes. Are these for an M, standing for MARIA? I can think of no other explanation. If it be correct, the stone is symbolically unique among early Christian slabs in Ireland. Compare the M in the initial of the name on the stone. a = alpha, symbolizing the beginning v = omega, symbolizing the end.